The 1977 Milwaukee Brewers are generally looked at as a transitional team to the contenders that graced County Stadium from 1978-82. Popular first baseman George “Boomer” Scott and future star catcher Darrell Porter had been traded away in separate deals. New to the team were pitcher Bob McClure, first baseman Cecil Cooper, and star third baseman Sal Bando. General Manager Jim Baumer and manager Alex Grammas waited for players such as Robin Yount, Gorman Thomas, Sixto Lezcano, Charlie Moore, and Moose Haas to develop. They also had high hopes for 21-year-old righty Lary Sorensen. Grammas called Sorensen up from the minors to make his big-league debut at County Stadium on June 7, 1977. Sorensen lasted 6.1 innings, giving up 7 hits and 4 runs. He didn’t figure into the 7-6 win that Milwaukee pulled off in the bottom of the ninth inning over Baltimore. On the same day that Sorensen made his debut, the Brewers made a fantastic draft choice in the first round. Unbeknownst to the scouting department at the time, they nabbed a future member of the 3000-hit club and National Baseball Hall of Fame. His name was Paul Molitor, a Minnesota native who grew up lettering in soccer, basketball, and baseball for his final three years of high school. Molitor had previously been selected by St. Louis in the 28th round of the 1974 draft. The Cardinals offered just a $4000 signing bonus, which Molitor turned down in favor of attending the University of Minnesota on a scholarship. When the Brewers picked Molitor with the third overall choice in the 1977 draft, Molitor signed on the dotted line for $100,000. In doing so, he forfeited his final season of eligibility at the U of M.
Molitor was called Paulie or Molly by his close friends. Milwaukee Brewers fans later referred to him by those names and used the nickname “The Ignitor” due to the spark he created at the top of the batting order (although Molitor himself was not fond of that monikor). Molitor made his professional debut on June 26 with the Bees at Community Field against the Appleton Foxes. He picked up two hits including a solo homer and scored three times, plus handled five chances at shortstop without an error. 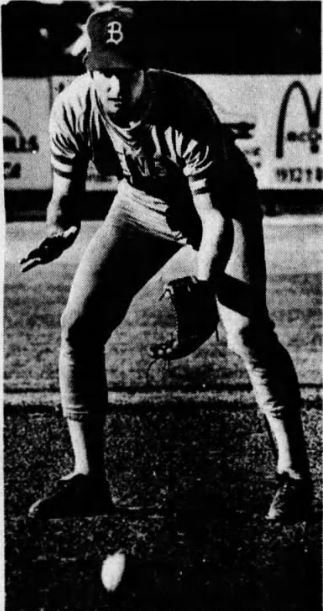 The Bees offense stormed to a 17-0 win to back starter Tim Bannister, who became the first Bee to throw a shutout in the 1977 season. Molitor hit in the second spot in the lineup and got drilled square in the back by starter Bob Madden in his first at bat. Molitor’s first professional homer came off Dewey Robinson to lead off the seventh inning. It was Molitor’s catch on a soft liner in the ninth inning that preserved the six-hit shutout. Molitor also made a fine play in the eighth inning to save a run from scoring. With a runner at second and two out, he raced behind second base to haul in a blooper and end the threat. On the opposite side, the Foxes had some kid named Harold Baines playing right field. He was only the number one the number one draft choice in all of baseball that year by the Chicago White Sox. Baines also had a great game and chipped in two of his team’s six hits. Molitor went on to hit .346 over 64 games in 1977 with 8 home runs and 50 runs batted in. He had 318 chances in the field, all at shortstop, and committed 28 errors for a .912 fielding percentage. Molitor helped the Bees to a 71-68 record, but they were no match for the Clinton Dodgers and finished 8.5 games back. Burlington only had two other players besides Molitor to don a major league uniform – first baseman/outfielder Jésus Vega and pitcher Willie Mueller. 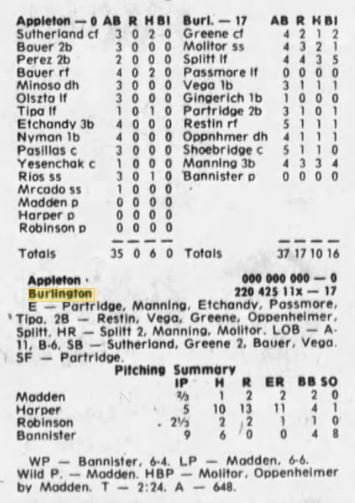 Vega had a couple of short stints with Minnesota, and Mueller pitched briefly for Milwaukee in 1978 and 1981. Molitor made the jump to the Brewers in 1978, and the rest as they say, is history.